In the ever-challenging world of motherhood, it’s never easy to place one’s own priorities above those of your child. Sure, it’s important to carve out that personal time, particularly to focus on health and fitness, but at the end of many days, many moms find that work tending to their child’s (or children’s) health, fitness, and well-being fills that space. But there’s a new category of fitness classes that aims to curb that behavior, and this does not appear to be just another fitness fad. Mommy and me fitness classes are popping up in all realms of the exercise world. While prenatal yoga long has been a mainstay for expectant moms, mommy and me classes are giving moms time to exercise and integrating their babies or toddlers into the mix. Babies are part of the action at Bella Bundle classes, as moms get their workouts in with the kids in tow. The mommy and me classes involve the child just as much as the mom. 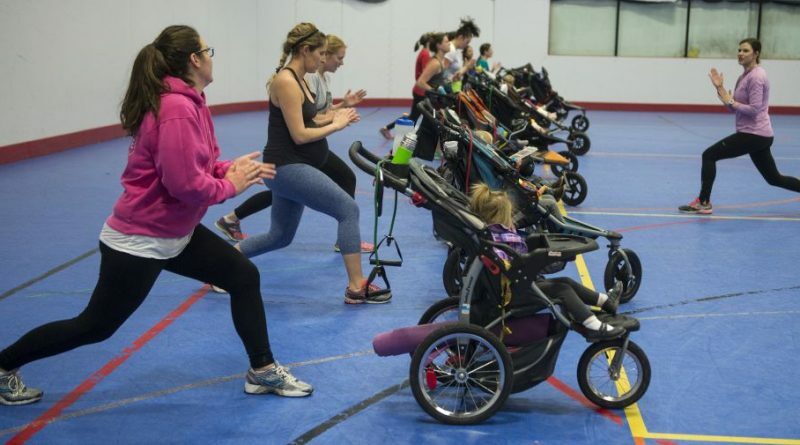 Fit4Mom’s popular Stroller Strides classes, for example, offer moms a full-body workout with the kids engaging with them in the stroller. With their young ones looking on, Gerberick said, it sets a good example for them as to the importance of exercise, and fun games and movements get them involved as well. 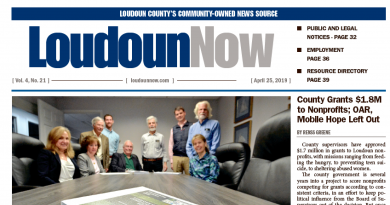 And Gerberick’s franchise, which includes the Ashburn, Leesburg, and Sterling territories, also organizes free playgroups after the class where the young ones can participate in a craft or activity, so the social component also is present. 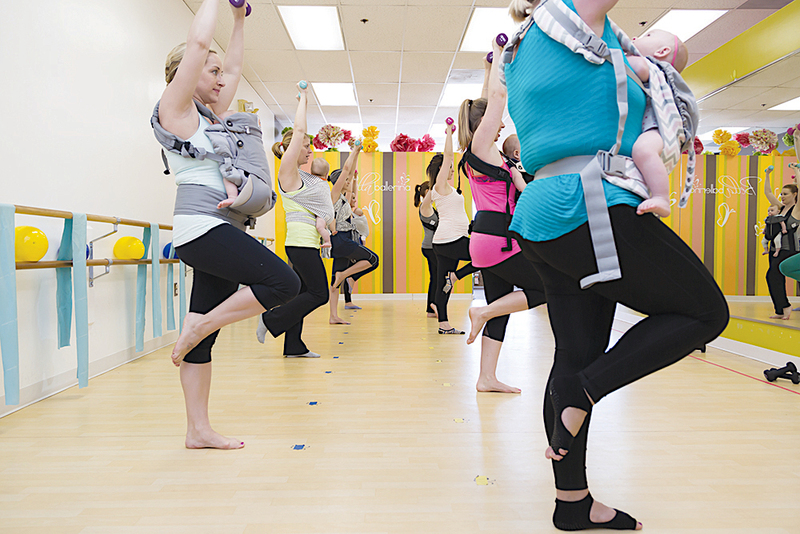 Newer to the scene is the Bella Bundle classes, which allows baby-wearing moms an exercise opportunity with their baby and toddler strapped to them. Owner Jenna DeLashmutt had been working for Bella Ballerina, a studio for young dancers, when she started taking barre classes during her pregnancy. Seeing the wonders it did for her own pregnancy, she began teaching classes while wearing her baby, and the concept was born. Now, Bella Bundle has attracted a loyal following, that incorporates the resistance of their baby or toddler for a high-rep, low-intensity workout. Both Gerberick and DeLashmutt can tailor an exercise regimen to individual moms, as they go through the body healing stages post-birth. Fit4Mom even offers a Body Back series, where moms’ workouts are supplemented by nutrition plans and, perhaps most importantly, support and motivation. Forever Yoga co-owners Ashley Miller and Kristen Murphy began their business last spring. Their parent-child and family yoga classes have been popular. Some classes even are held outdoors. And the yoga classes involve them as well, with the young ones encouraged to climb over or under mom or dad as they strike their poses. The family yoga classes, geared to children age 2 and up, also integrates games, dances, and poses named after animals that of course evoke the appropriate animal sounds. Mommy and me fitness classes are becoming more prevalent at county recreation facilities and other fitness establishments. For more information on the three above businesses, go to ashburn.fit4mom.com, bellabundle.com, or foreveryogava.com.